There is great news to share. Jose received his heart transplant on February 7th. He is doing well and on the long road to recovery. He is so grateful to all his friends and family for their never-ending support through this journey. We are writing this letter to tell you about José Calderón and ask you to help him. 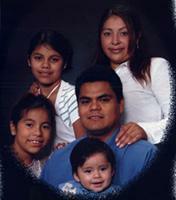 Before March 22, 2008 José, father of three, husband, and sole provider for his family, was a “healthy” man. He had no idea that on the evening of that day he would undergo a drastic and life-changing event that would leave him unable to work. He began to feel chest pain and was rushed to the Fountain Valley Hospital where he underwent emergency heart surgery due to a heart attack. The surgery was successful but the damage to his heart was irreparable. After the surgery there were some complications and José had to be connected to artificial life support and then transferred via helicopter to UCLA Medical Center. At UCLA, the doctors monitored José day and night and it was a miracle that he came back to life. The repercussions of the heart attack were yet to be seen in the months following. During his recuperation process there were many setbacks where he had to be hospitalized for weeks at a time due to various complications. It became clear that his heart would not ever regain enough function and that a heart transplant was José’s only chance at a long and healthy life. Once again, José Calderón, his children, and his family thank you for your kindness and support to overcome this difficult time in our lives. We have faith in the Lord and pray for a favorable outcome; please join us in our prayers so that José is healed and able to grow old to see his children become great men and women. Best wishes to you and your family. I''ve taught with Araceli at Tustin High for several years, and she told us your story. Hope you get your transplant and much better soon. My best wishes to you and your brother, Alberto.